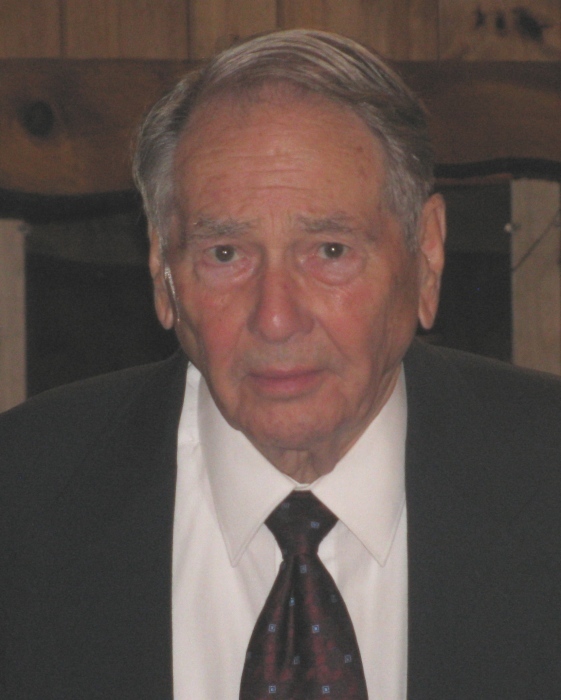 WISCASSET LeRoy E. “Roy” Farmer, after a lifetime of service to residents of Maine, Lincoln County and the town of Wiscasset, peacefully passed away at home on Tuesday, March 26, 2019, at the age of 91. In the weeks just before his passing, Roy was surrounded by four generations of loving family and numerous friends who came to visit, celebrate and reminisce with a man whose generosity, kindness and indomitable work ethic were legendary. Roy was born on April 8, 1927 in British Honduras, to parents from Lincoln County, Raymond Farmer and Carolyn Greenleaf Farmer, while Raymond managed a banana plantation for United Fruit Company. The family then moved back to Maine, first to Boothbay Harbor and then to Wiscasset when Roy was 3 years old. Roy graduated from Wiscasset Academy in 1944, joined the army in 1945 and served his tour of duty in Germany at the end of WWII in the Constabulary Forces. He received a Bachelor’s degree in Business Administration at the University of Maine, Orono and married the love of his life, Joanne Pearson in 1951. Roy became a licensed insurance agent in 1953, a licensed real estate agent in 1954 and a licensed Realtor in 1958. He bought the Hawe’s Insurance Agency in 1953, which merged with and became Carl M.P Larrabee Insurance Agency, a partnership, in 1963. Roy continued as president and co-owner of the Larrabee Agency until his death. In 1954, the year after the Hawe’s purchase, Roy started the Roy Farmer Real Estate Agency, of which he remained owner and designated broker for 55 years until it was purchased by the Carleton Group in 2009. Roy continued to work for the Carleton Group as a full-time broker until the age of 88. In addition to Roy’s private business endeavors, the list of his civic and community business accomplishments is simply jaw-dropping. Roy served as Selectman for the Town of Wiscasset; served on the Wiscasset Town Budget Committee; was elected and served on the 98th House of Representatives for the State of Maine; served as a Trustee of the Wiscasset School District for 25 years; was elected and served for 28 years as Lincoln County Register of Probate; was elected and served 2 years as Lincoln County Treasurer; served 30 years as Bail Commissioner for Lincoln County; was past President of the Lincoln County Board of Trustees; was past President of the Lincoln County Board of Realtors; was past President of the Wiscasset Alumni Association; was a founder and served as Vice President of the Wiscasset Industrial Development Corporation created to help the town purchase almost all of its downtown waterfront from the Wiscasset Farmington Waterville Railroad and was a Corporator for the Bath Savings Institution and the Wiscasset Public Library. Roy received the 2001 Business Man of the Year Award from the National Republican Congressional Committee’s (NRCC) Business Advisory Council. In 2012 Roy received the Barnes and Smith Lifetime Achievement Award at the first annual meeting of the Wiscasset Chamber of Commerce, was awarded the Town of Wiscasset Business Recognition Award by the Board of Selectman and the 2012 Wiscasset Town Report was dedicated to him. Roy was a Life member of the Maine Association of Realtors, was Realtor Emeritus with the National Association of Realtors and was the Lincoln County Realtor of the Year in 2014. Roy was also a member of Bradford-Sortwell-Wright American Legion Post 54 in Wiscasset, the Masons of Lincoln Lodge #3, the Midcoast Conservancy, St. Philip’s Episcopal Church in Wiscasset and a 59 year member of the Wiscasset Fire Society. A soft spoken, humble man, Roy was widely known as a true gentleman and for his honesty, selflessness and generosity. He was completely devoted to his immediate and extended family and spent time and effort every day to make all their lives better. Roy also made time for anyone needing help or advice and was a mentor to many successful business people in Lincoln County. Roy was a fixture at every Wiscasset Town meeting where he was often asked for counsel in regard to all things real estate. Roy grew up on the water and always had a power boat with which he and his wife Joanne entertained family and friends on the Sheepscot River and around Boothbay Harbor. Roy loved fishing, whether for mackerel or stripers from his boat or fly fishing Pierce Pond near the Forks or salmon fishing in Alaska. He and Joanne also hosted annual family ski vacations at Sugarloaf Mountain for many years and loved to travel with friends and family within the US, Canada and to Europe, Mexico, Hawaii, Central America, Bermuda and the Caribbean. Roy was predeceased by his parents, Raymond and Carolyn Farmer, his brother Wesley Farmer and wife Helen, sister Verne and husband Wilford Cronk and sister June and husband Nels Paulson. Roy is survived by his loving wife of 67 years, Joanne Pearson Farmer, his dedicated daughter Kim Farmer Haeberle and her husband Robert W. Jr., grandson Matthew Roy Haeberle, grandson David Robert Haeberle and his wife Melissa Sewall Haeberle, great grand-daughter Maya-Rose Melinda Haeberle, sister-in-law Jane Stevenson and many beloved cousins, nieces, nephews and their families. Visiting hours will be held on Saturday, April 6, 2019 from 4 to 6 PM at the Daigle Funeral Home, 819 High Street, Bath. A service with military honors will be held at the Wiscasset Community Center at 2 PM, Sunday, April 7, 2019. A reception will follow. Burial will be at Woodlawn Cemetery in Wiscasset. To view Roy’s memorial page or to share on-line condolences, visit www.daiglefuneral home.com. Memorial contributions may be made to your favorite charity or to any one of the many organizations Roy supported such as St. Philips Episcopal Church in Wiscasset, Midcoast Conservancy, Lincoln County Historical Association, Morris Farm Trust and the Wiscasset Public Library.